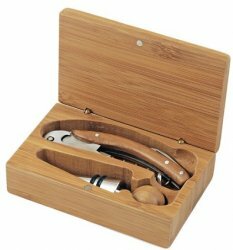 This beautiful gift box is made from genuine bamboo. It includes a classic style wine opener and a wine bottle stopper. This elegant gift set is the perfect gift for any wine lover, and has everything they could possibly need to enjoy their wine!